An ad agency contacts Harry to find a young woman with an ordinary face for a TV commercial. Lucy convinces Harry into allowing her to take the job. 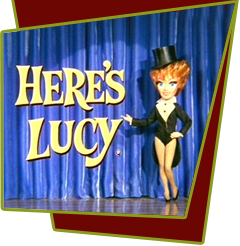 Unfortunately, the ad concept is changed to a musical one, and Lucy can't dance on her still-mending leg. All seems lost until Harry sells the agency on using both Lucy and Kim. As filming on the commericial is about to begin, Lucy is nowhere to be found, as she finds herself caught up in yet another mishap. Special Notes: This episode is based on I Love Lucy episode #30, "Lucy Does a TV Commercial", the famous Vitameatavegamin show. This time Lucille overreacts to the taste of sour pickles as she rehearses her lines over and over. Bloopers: In the scene inside the TV studio the ladder is stenciled LBP, Lucille Ball Productions.